Every minute we spend on our business is one that helps it grow … or not. The idea is to connect to all of the people who help us thrive — colleagues, customers, vendors, partners, family, friends — people who want to see our business growing faster, more easily, and with more meaning. Those people who already know us and love what we’re going are the network, the beating heart, that holds us up and spreads our message to the right people in the very best way. Having a powerful network of fans means our message is seen, heard, understood and spread with the speed and reach of the Internet. How do you get a network like that? 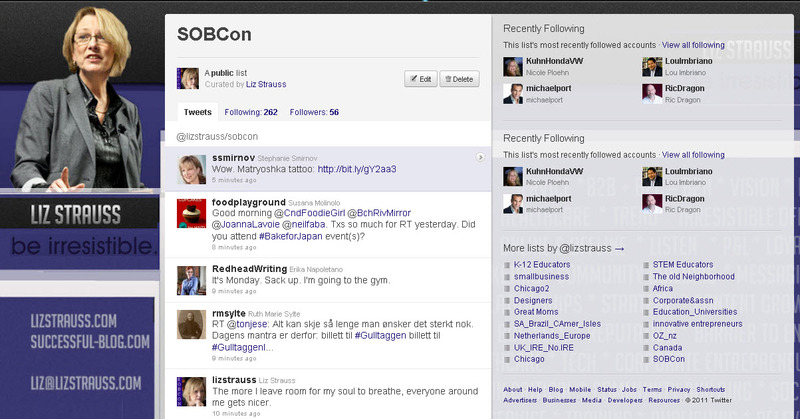 I often call Twitter the world’s largest networking room, but that doesn’t do it justice. Networking rooms are physical and geographically limited. They can’t expand and contract in size. The people who visit the room are limited by those who can physically get to the location where the meeting and the room exists in space and time. And not every networking event collects the people who are interested in what we do. How do we find that first group of friends that we invite to our Twitter networking event? Before you build a network, think about the people you want to attract. Who are the people who support what you’re doing and naturally pass it on? Those are the folks you want to attract. Be irresistible for them. Think too about the people who would rather not participate in your success, the people who see you as what you’re not, look things over to see that you’re not attracting them. When we focus on serving the people who trust our abilities and love what we do, they tell their friends about it. If we work to convert people who don’t trust our abilities and value our service, they look for reasons that we’re not doing what they think we should do. Concentrate on reaching that first group with the best you can offer. Know and share who you are. Have one clear business message. Define yourself clearly as a business person. Use a photo. 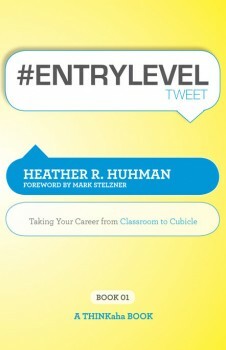 Write a professional bio. Name the metropolitan area you’re in. Link to a business site that tells more about you. Some folks link to a special page on their blog set up just for Twitter visitors. Add a unique background to further define yourself. Research the ways you might connect. Check out how @DellOutlet , @ComcastCares , @TwelpForce , @AlyssaMilano , @WholeFoods , @SharnQuickBooks and others use Twitter to connect. You may not be as big as they are, but you can learn from their approach. Know and share why you’re there. Manage expectations. Let people know from the beginning the way you intend to serve their needs. If you want Twitter to be your relationship command center, you’ll set it up differently than if you want it to be your idea lab, your outlet store, or your customer service base. Decide before you start. Start small with friends and their friends. Start by following the friends you already have. Look for people in your industry by using the Who to Follow option at right in the black bar at the top of your Twitter.com page. I’m going to a conference for the National Council of Teachers of Math (NCTM). When I started following folks who know the conference, I met a man who works for CLIME –The CLIME guy – CLIME is the math/tech affiliate of NCTM since 1988 http://clime.org After visiting his page to read his tweets, I knew I wanted to follow him. 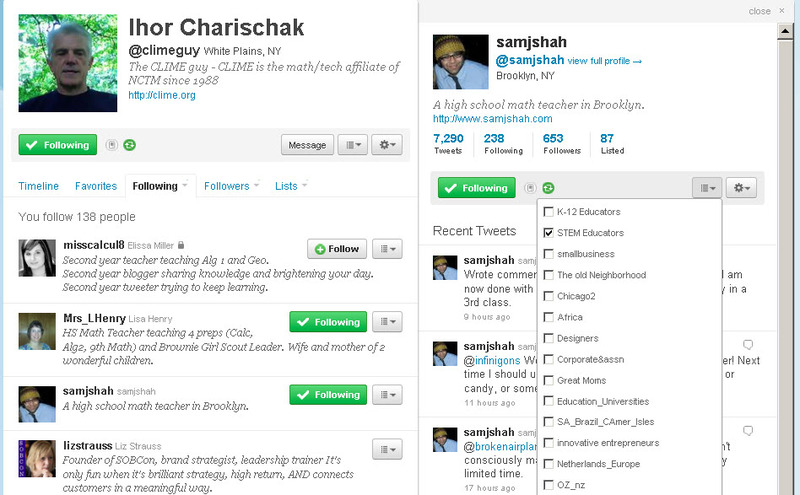 So I checked his profiles, read his tweets, and listed Sam in my list of STEM educators (Science Technology Engineering and Math Teachers) so that I could keep up with what Sam is talking about. Check the curated lists and the hashtags to find who and what your heroes find relevant. Choose to follow a limited number a day. 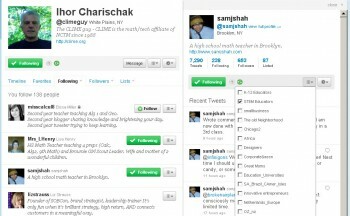 Tweeps make lists to follow whole conversations by a group of people that the value around a common thread. For example I have a list of Twitter people who commented on blog in 2005. I use it to check in on what my more experienced friends are talking about. You can check my lists from my profile page. and Sulia (once called tlists to more channels of of Twitter people who share your interests. 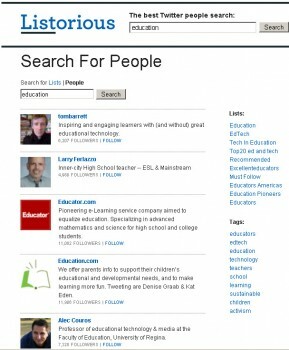 and Use the search function at hashtags.org to find and follow tweets that people mark with a hashtag such as #edchat. Or use Search.Twitter.com to go quickly to a hashtag you might already know.#nctm (the name of a conference) or #mathchat (the name of topic of interest.) See who’s sharing insights and information that you find relevant and follow them. Listen before you join in. Get to know how they talk and what they talk about. Following both ways allows you to have private conversations. When quality people follow you back, use that as opportunity to say hello to them in a unique and personal way. When new folks follow you first. check their profile and follow them back if you want to start a relationship. You have to be following both ways to share a private conversation via direct message. Direct message is how Twitter people share information they don’t want to share publicly. Add value to the conversation. Be helpful, not hypeful, just as you might be in person. Use the @ sign (@lizstrauss) to make sure your comment about a person or to a person gets to the person you’re mentioning. Some things you might Tweet about and how to Tweet them. Tweet to share an insight or something you’ve observed. The more I leave room for my soul to breathe, everyone around me gets nicer. Tweet to respond to what someone said. Tweet to start a conversation by saying hello and asking a question..
Good morning, Twitterville. How will you make someone’s life better today? Tweet to share information or content using hashtags – especially when you can promote your friends. The above Retweet would look like this if she had typed it — and we can edit / add to it!. Start your Twitter list. 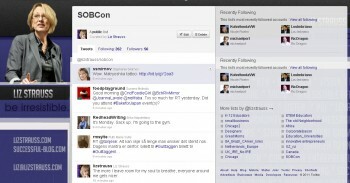 This is my SOBCon list — people who attend our yearly business event – SOBCon. Lists draw attention to and from people. Each list can focus on one group of people. Check the lists that other folks make, see what their lists say about them. Have a core list strategy. Lists might include a handful of advisors, thought leaders in your industry, partners and vendors, key customers and clients, people in your home location. Decide early who you will follow – who you want at your networking event. Some folks follow only a few people and keep their followers limited to people in their business. Other folks look for input from a wider group. If you’re looking for clients, don’t just talk to the people who do what you do. It’s fun and safe to talk business with our peers, but the folks who hire us are the folks who don’t know how to do what we do. Like any networking event, Twitter is filled with opportunities to meet people who want to participate, engage, and be a part of what we’re doing. The difference is that some networking rooms are filled with people who have no business in common with us. On Twitter, we can reach out to folks who are interested in being at the same networking event as us. Have you figured out other other ways to tailor the Twitter experience to fit your best reason for being there? Tailoring Twitter: Get Busy Folks to âGetâ Twitter in 2 Minutes Flat!